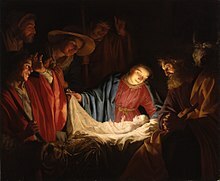 Adoration of the Shepherds by Gerard van Honthorst, 1622. ^ John P. Meier writes that Jesus' birth year is c. 7/6 BC. Rahner states that the consensus among historians is c. 4 BC. Sanders favors c. 4 BC, and refers to the general consensus. Finegan supports c. 3/2 BC, defending it comprehensively according to early Christian traditions. ^ Meier, John P. A Marginal Jew: The roots of the problem and the person. Yale University Press. 1991: 407. ISBN 978-0-300-14018-7. ^ Rahner 2004, p. 732. ^ Sanders 1993, pp. 10–11. ^ Finegan, Jack. Handbook of Biblical Chronology, rev. ed.. Hendrickson Publishers. 1998: 319. ISBN 978-1-56563-143-4. ^ Humphreys, Colin J.; Waddington, W.G. The Jewish Calendar, a Lunar Eclipse and the Date of Christ's Crucifixion (PDF). Tyndale Bulletin. 1992, 43 (2): 340. ^ Ehrman, Bart. Forged: writing in the name of God – Why the Bible's Authors Are Not Who We Think They Are. HarperCollins. 2011: 285. ISBN 978-0-06-207863-6. ^ Burridge, Richard A.; Gould, Graham. Jesus Now and Then. Wm. B. Eerdmans Publishing. 2004: 34. ISBN 978-0-8028-0977-3. ^ Strong's Greek: 5547. 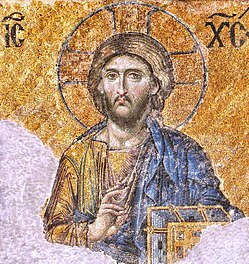 Χριστός (Christos) -- the Anointed One, Messiah, Christ. biblehub.com. [2017-11-12]. 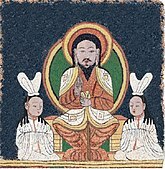 ^ 創世紀 五:1-32. bible.ccim.org. [2017-11-12]. ^ 創世紀 十一:10-26. bible.ccim.org. [2017-11-12]. ^ 馬太福音 一:1-16. bible.ccim.org. [2017-11-12]. ^ Tuckett, Christopher. Sources and methods. (编) Bockmuehl, Markus N. A. Cambridge Companion to Jesus. Cambridge University Press: 123–4. 2001. ISBN 978-0-521-79678-1. All this does at least render highly implausible any far-fetched theories that even Jesus’ very existence was a Christian invention. The fact that Jesus existed, that he was crucified under Pontius Pilate (for whatever reason) and that he had a band of followers who continued to support his cause, seems to be part of the bedrock of historical tradition. If nothing else, the non-Christian evidence can provide us with certainty on that score. ^ Blomberg 2009, pp. 431–436. ^ Van Voorst 2000, pp. 39–53. ^ James Dunn states that these "two facts in the life of Jesus command almost universal assent" and "rank so high on the 'almost impossible to doubt or deny' scale of historical facts" that they are often the starting points for the study of the historical Jesus. ^ Jesus Remembered by James D. G. Dunn 2003 ISBN 978-0-8028-3931-2 page 339 states of baptism and crucifixion that these "two facts in the life of Jesus command almost universal assent". ^ Crossan, John Dominic. Jesus: A Revolutionary Biography. HarperOne. 1995: 145. ISBN 0-06-061662-8. That he was crucified is as sure as anything historical can ever be, since both Josephus and Tacitus...agree with the Christian accounts on at least that basic fact. ^ Craig Evans, "Life-of-Jesus Research and the Eclipse of Mythology," Theological Studies 54 (1993) p. 5. ^ Sanders, E. P. The Historical Figure of Jesus. Penguin. 1993. ^ Charles H. Talbert, What Is a Gospel? The Genre of Canonical Gospels pg 42 (Philadelphia: Fortress Press, 1977). ^ Louis Feldman (ISBN 978-90-04-08554-1 pages 55-57) states that the authenticity of the Josephus passage on James has been "almost universally acknowledged". ^ 原文："Since the Jews constantly made disturbances at the instigation of Chrestus, he expelled them from Rome." ^ The Blackwell Companion to Jesus p220 Delbert Burkett - 2010 "That is to say, varying presuppositions as to the extent to which the ancient rabbis were preoccupied with Jesus and Christianity can easily predetermine which texts might be identified and interpreted as having him in mind." ^ Robert E. Van Voorst. Jesus outside the New Testament. 2000 ISBN 978-0-8028-4368-5. p. 124. "This is likely an inference from the Talmud and other Jewish usage, where Jesus is called Yeshu, and other Jews with the same name are called by the fuller name Yehoshua, "Joshua""
^ Meier, John P. The Roots of the Problem and the Person (Convenience link). A marginal Jew: rethinking the historical Jesus 1. Anchor Bible Series. 1991: 98 [August 3, 2011]. ISBN 978-0-385-26425-9. LCCN 91010538. OCLC 316164636. While not accepting the full, radical approach of Maier, I think we can agree with him on one basic point: in the earliest rabbinic sources, there is no clear or even probable reference to Jesus of Nazareth. Furthermore, I favor the view that, when we do finally find such references in later rabbinic literature, they are most probably reactions to Christian claims, oral or written. ^ Theissen, Gerd; Merz, Annette. The Historical Jesus: A Comprehensive Guide. Minneapolis: Augsburg Fortress. 1998: 74–76. ISBN 978-0-8006-3122-2. LCCN 98016181. OCLC 38590348. ^ Van Voorst 2000 - see also Thiessen and Merz mention Gustaf Dalman (1893), Johann Maier (1978), and Thoma (1990) in favour of this conclusion. * Theissen, Gerd and Annette Merz. 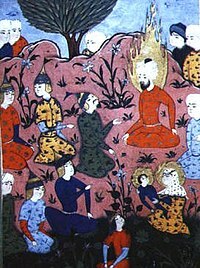 The historical Jesus: a comprehensive guide. Fortress Press. 1998. translated from German (1996 edition). p. 74-76. *See also Jeffrey Rubenstein, Rabbinic Stories (The Classics of Western Spirituality) New York: The Paulist Press, 2002 & Daniel Boyarin, Dying for God: Martyrdom and the Making of Christianity and Judaism, Stanford University Press, 1999. ^ Robert E. Van Voorst Jesus Outside the New Testament: An Introduction to the Ancient Evidence Eerdmans Publishing, 2000. ISBN 978-0-8028-4368-5 page 16 states: "biblical scholars and classical historians regard theories of non-existence of Jesus as effectively refuted"
^ Amy-Jill Levine in The Historical Jesus in Context edited by Amy-Jill Levine et al. Princeton Univ Press ISBN 978-0-691-00992-6 page 4: ""There is a consensus of sorts on a basic outline of Jesus' life. 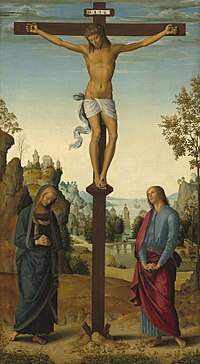 Most scholars agree that Jesus was baptized by John, debated with fellow Jews on how best to live according to God's will, engaged in healings and exorcisms, taught in parables, gathered male and female followers in Galilee, went to Jerusalem, and was crucified by Roman soldiers during the governorship of Pontius Pilate"
^ Christians And The Holy Places - The Myth Of Jewish-Christian Origins, Joan E. Taylor, Clarendon Press Oxford, Oxford University Press 1993. ^ Bargil Pixner, Wege des Messias und Stätten der Urkirche, Giessen/Basel 1991, p. 275. English edition (2010): Paths of the Messaiah. Ignatius Press: San Francisco, p.
^ Miller, Sam. Tourists flock to 'Jesus's tomb' in Kashmir. BBC. 27 March 2010 [27 November 2010]. ^ The Japanese Jesus Trail. BBC. September 9, 2006 [2006-12-13]. ^ Goodacre, Mark. Duke University Religion Department: The Talpiot Tomb Controversy Revisited. Duke University Religion Department. 2008-01-21 [2017-11-12]. ^ 科學家：實驗證耶穌家族墓無誤. 中時電子報. 2015-04-08 [2017-11-17] （中文（台灣）‎）. ^ 係金A！以色列科學家證實　陶比奧古墓就是耶穌家的！. ETtoday新聞雲. 2015-04-08 [2017-11-17] （中文（台灣）‎）. ^ Witherington, Ben. The Jesus Tomb? 'Titanic' Talpiot Tomb Theory Sunk from the Start. 2007-02-26 [2007-02-28]. ^ <name="heiser"> Heiser, Michael. Evidence Real and Imagined: Thinking Clearly About the "Jesus Family Tomb" (PDF): 9–13. [2007-06-08]. ^ For a general comparison of Jesus' teachings to other schools of first century Judaism, see John P. Meier, Companions and Competitors (A Marginal Jew: Rethinking the Historical Jesus, Volume 3) Anchor Bible, 2001. ISBN 978-0-385-46993-7. ^ Sanders, E. P. Jesus and Judaism, Fortress Press, 1987. ISBN 978-0-8006-2061-5. ^ Maccoby, Hyam Jesus the Pharisee, Scm Press, 2003. ISBN 978-0-334-02914-4. ^ Falk, Harvey Jesus the Pharisee: A New Look at the Jewishness of Jesus, Wipf & Stock Publishers (2003). ISBN 978-1-59244-313-0. ^ Neusner, Jacob A Rabbi Talks With Jesus, McGill-Queen's University Press, 2000. ISBN 978-0-7735-2046-2. ^ Stegemann, Hartmut The Library of Qumran: On the Essenes, Qumran, John the Baptist, and Jesus. Grand Rapids MI, 1998. ^ Broshi, Magen, "What Jesus Learned from the Essenes," Biblical Archaeology Review, 30:1, pp. 32–37, 64. ^ The Historical Jesus in Recent Research edited by James D. G. Dunn and Scot McKnight 2006 ISBN 978-1-57506-100-9. p. 303. ^ Who Is Jesus? by John Dominic Crossan, Richard G. Watts, 1999. ISBN 978-0-664-25842-9. pp. 28-29. ^ Discovering the language of Jesus by Douglas Hamp, 2005. ISBN 978-1-59751-017-2. pp. 3-4. ^ 耶稣12岁以后到西藏学佛，子虚乌有. 博讯新闻. 2007-06-25 [2017-11-12]. ^ Inc., Internet Innovations,. The Lost Years of Jesus: The Life of Saint Issa - Notovitch. reluctant-messenger.com. [2017-11-12]. ^ 為什麼猶太人不信耶穌 (PDF). （原始内容 (PDF)存档于2009-07-11） （中文）. ^ Come and Hear: Sanhedrin 43. ^ 瀛事大搜查﹕耶穌日本終老?. 明報. 2010-05-25 [2010-05-25]. （原始内容存档于2011-05-14）. ^ Daniel Gaztambide (2005), "So Sayeth The Lord... According to Who?". ^ Stephen Voorwinde, "The formation of the New Testament"[永久失效連結], Patornet. Accessed October 25, 2005. ^ F. F. Bruce, New Testament Documents: Are they reliable?, "Chapter 3: The Canon of the New Testament" (June, 1982), ISBN 978-0-87784-691-8, Inter-Varsity Press. ^ Coey Keating (December 11, 2005), "Criteria for development of the New Testament canon in the first four centuries of the Christian Church", Fuller Theological Seminary. ^ Bruce Metzger (1987), The New Testament Canon, page 254. ^ Josh McDowell (1992), "Evidence for the Resurrection". ^ F. F. Bruce (1959), "THE NEW TESTAMENT DOCUMENTS Are they Reliable?". ^ Gary Habermas (2001), "Why I Believe The New Testament Is Historically Reliable"[永久失效連結].